Review: Whoosh! That is the sound of a soccer ball hitting the net in the book Benched, an amazing book. 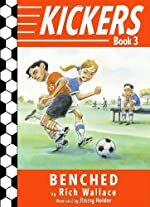 Benched is part of the Kickers series which is written by Rich Wallace, and Ben is the main character. Ben, a nine year old boy who plays soccer and is very energetic, plays soccer for a team is called the Bobcats. Therefore, this book would be a great choice for any soccer player. Soccer is more than a sport it is a lesson where you and Ben learn many life skills. For instance, Ben learns many things out on the soccer field. One, thing he learns is how to handle being bullied and what to do. Ben, also learns that there are consequences for bullying the other team back. Some consequences are good and some are bad, but they all have an outcome on the story. Benched is a considerably remarkable book. The way the author Rick Wallace makes you feel the character's emotions. For example, in the book Ben gets really upset because he is getting fouled and the referee isn't calling the fouls. The reason I picked up this book and read it because I am also a soccer player and have hardships and wanted to hear what other soccer players go through. Also, I have a connection with Ben. My connection is that Ben keeps getting fouled and the referee isn't calling it. That same thing happened to me. The only exception is that he didn't get physically hurt like I did. I got fouled and got hurt and the referee didn't even call it! So you can feel the tension and heat between the two teams. Anyone who loves soccer would love Benched. We would like to thank Random House for providing a copy of Benched for this review. Have you read Benched? How would you rate it?